When it comes to Scotland there are certain things, about which everyone expects to hear, see or at least taste. These aren’t big enough for a standalone post but they do fit into the broader category of the Scottish Highlands. 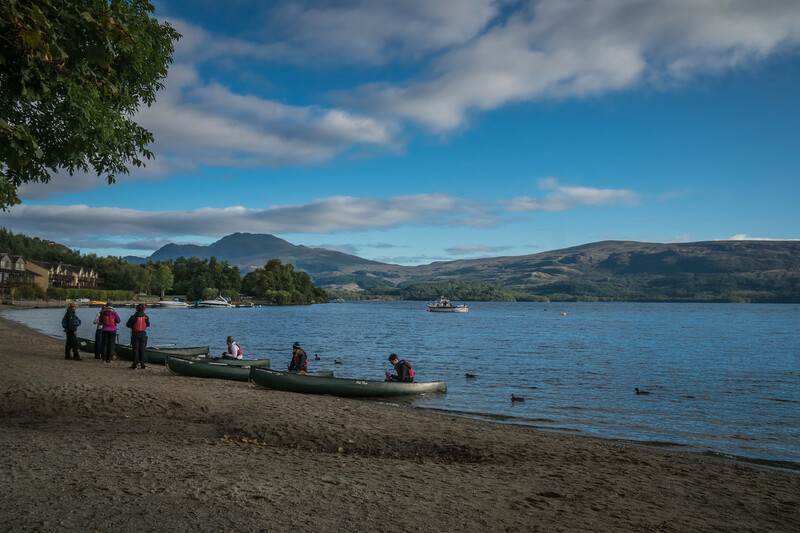 The best way to illustrate my point is to mention Loch Lomond. Yes, I fell flat on my face while there but no worries, I bounced up again! Let’s not dwell on it. This large lake is right on the Highlands-Lowlands border. Surely, some of it must be in the Highlands. As the image above illustrates, the lake is a holiday spot. It was a beautiful morning and boats were everywhere. I did learn one thing about lochs. I thought they were simply lakes but actually, a loch is either fresh or sea water. According to my bus driver, one can tell by the seaweed. If there’s seaweed, the loch is seawater. Our bus meandered about the western Highlands. We had some MacDonalds on board. Obviously, they were eager to visit Glencoe and do a little Campbell-bashing. 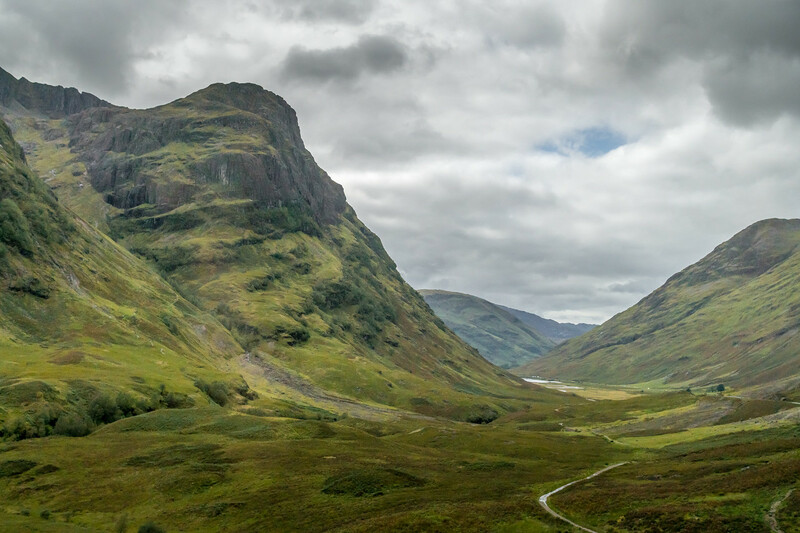 Glencoe is the site of a massacre. It’s a strange and gruesome story involving the Jacobite efforts of James II of England to reclaim his throne and the recognition of the new monarchs, William and Mary. Or perhaps I should say, the lack of recognition. The story goes that the Duke of Argyll’s men (Campbells) accepted the hospitality of the MacDonalds and then turned on them and killed them all because they had not sworn allegiance to the new king. No one really knows where this event took place, but evidently, the animosity lingers in this part of the Highlands. On a brighter note, the Glencoe area is popular for outdoor activities. The above image shows the trail that winds its way up to one of the craggy peaks. You can just make out a pair of hikers in the center of the shot. I really wanted to show the entire trail. The hikers just give a feeling of scale. This is the perfect place for backpacking, and fishing as well. In the winter there is a ski resort nearby. The rock formations are interesting; they look volcanic. We didn’t stay long at our roadside viewing area. All too soon it was back on the bus again. I want to talk about one other spot since I brought up the subject of Jacobite unrest. The poster child for the Jacobite efforts must be Bonnie Prince Charlie. Goodness, one can’t go anywhere without hearing about his exploits. Do I dare try to explain who he is? I shall call him the last of the Stuart kings. When Elizabeth I of England died in 1603, she was childless. The throne went to a distant Stuart cousin who was the son of Mary Queen of Scots. His name was James and he became James I of England. (He was already James VI of Scotland.) 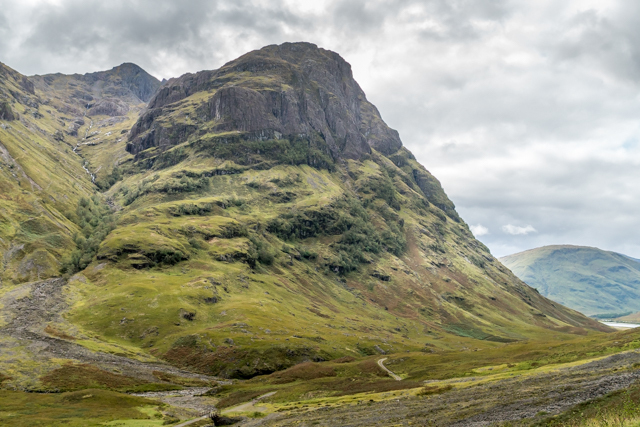 His grandson was James II mentioned above in regard to Glencoe. Bonnie Prince Charlie was the grandson of James II of England. To say there were a few other confusing elements would be putting things mildly. The main problem was that England had become Protestant and this Stuart wannabe was Catholic. England looked elsewhere for her king and Bonnie Prince Charlie (Charles Edward Stuart) became the Young Pretender who tried to take back his throne in the Jacobite Uprising of 1745. 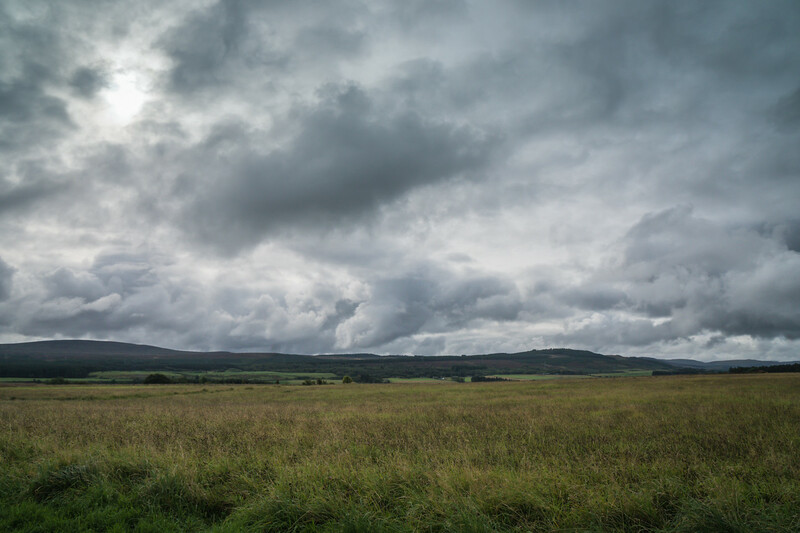 That’s the story in a nutshell and it brings us to the Battle of Culloden, a boggy plain in the western highlands. The forces of Bonnie Prince Charlie had won every battle against the Government troops. They expected to win this one as well but things went terribly wrong. The men were exhausted from marching all night. The Government troops were rested and better armed. When the Jacobite forces charged, they broke off into two groups. One fell behind the other because they were slowed by the boggy terrain. The Government cannon fire was brutal. 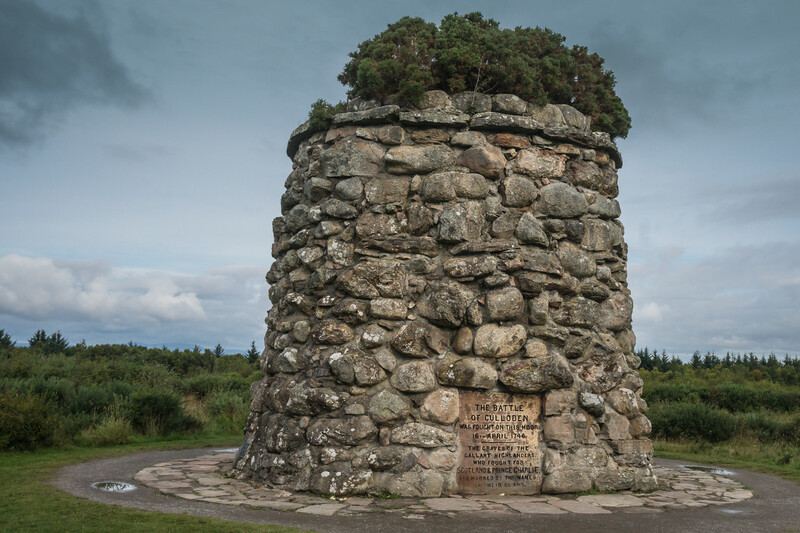 Of the 1,500 deaths at the battle of Culloden, about 1,000 were Jacobites. The government forces took no prisoners. Wounded men were given no mercy. Bonnie Prince Charlie fled Scotland after this battle. Is there romance in this story? I can’t find it. Perhaps it put an end to all the battles about kingship. I don’t know. Scotland only recently brought up again the question of independence. The above are merely three samples of places and names that figure in stories and song related to Scotland. 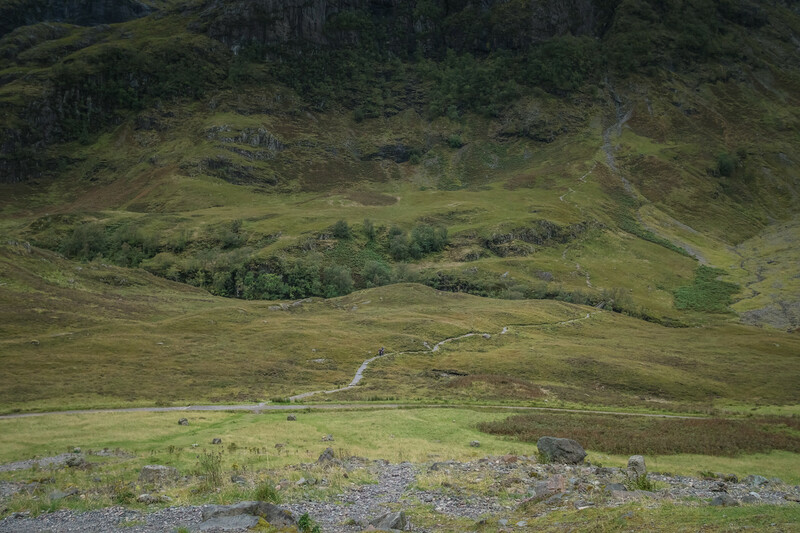 The Scottish Highlands are filled with beauty, fantastic and changing weather, and friendly people. I highly recommend you visit. To see more images of my Highland adventures, please click here.